Advance directives typically address scenarios such as an imminently terminal condition or a permanent coma. They generally do not address the more common scenario of gradually progressive dementia. Although progress has been made developing video aids and conversation kits to facilitate discussions about advance care planning in dementia, many patients do not have access to a simple written document to express their wishes for care if they should develop dementia. 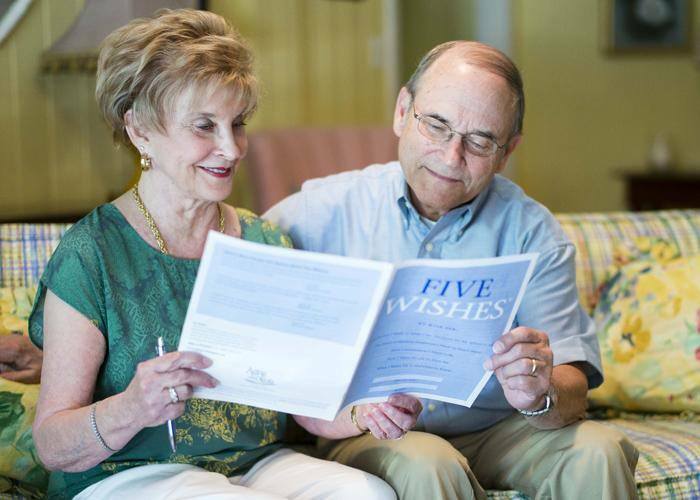 The Five Wishes is a legal document that currently meets the legal requirements for an advance directive in 42 states, including New York. This easy to read, straight forward legal document is sure to reduce family anxiety about surrogate decision-making as well as the patient’s anxiety about future care. Take a look at just how simple this is! Wishes 1 and 2 are both legal documents. Once signed, they meet the legal requirements for an advance directive in New York State. Wishes 3, 4, and 5 are unique to Five Wishes, in that they address matters of comfort care, spirituality, forgiveness, and final wishes. This section addresses matters of comfort care. Discussing what type of pain management you would like, personal grooming and bathing instructions, etc. It will include whether you would like to know about options for hospice care, among others. This section speaks to personal matters such as whether you would like to be at home, whether you would like someone to pray at your bedside, among others. The last portion of the document contains a section for signing and having it witnessed. Some states require notarization and are so indicated in the document. For more blog posts by Virginia Tortorici click here.